Thank you Michelle! Glad you enjoyed it. OMG….you just perfectly penned my thoughts and emotions! I have been an RRT for 12 years and absolutely hate getting “THAT” call. I remember my first time having to do a Palliative withdrawal I went to the bathroom and completely broke down…..I called my mom and told her I felt like I killed the elderly woman even though I knew she was brain dead. But yes…..evey time I clock out knowing no one passed I feel great…..but the days someone does I know I did my part…..and helped them meet their maker with pride and compassion. Kudos to all my fellow Healthcare worker! Oh….Happy Respiratory Care Week to you! Thanks Stephanie. Respiratory Therapists are still so poorly recognized as health care professionals…sometimes I feel like a little sprite that just flits in and out of acute care mysteriously. (Wearing either my white wings or black wings depending on the occasion). Big hugs to you for all of the incredible work you do. 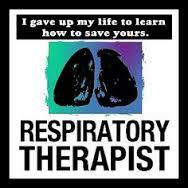 Happy Respiratory Therapy Week. Very well written, thoughful and poignant. Thank you for sharing your stories and lending a voice for ours. As a therapist of 24 years, I often reflect through my career and the many patients of various populations and disease processes I have had the privilege of providing care for, and at times, withdrawing care. Sometimes we portray being stoic and strong, when inside we are wrestling with the human emotion of loss. It is not only important to nourish those connections with our patients and their families but to maintain the human compassion with our own families despite the stresses. This is an important aspect to remember too; our own families must be willing to accept and deal with the pain we experience and be supportive. Thanks again. Thank you for sharing Andrew! 24 years! You must have some amazing stories! Your thoughts about how or work effects our families is so important. I am trying to build self-reflective practices into my daily routine to slow me to process all that we do and see in a day. One great side effect of this habit is not taking so much stress home with me. Everything from journaling, telling stories with co-workers and debriefing can help. Best wishes in the future, & keep up the great work! I love all the respiratory therapists nurses and Doctors that took extra special care of me in Regina Sask. General Hospital! I spent 3wks in ICU then moved to the respiratory Unit 6F, All together spent 5 and a half months there.They kept me alive and gave me more time..I now appreciate my life a lot more.. one never know what life they have left ..so enjoy every moment you have!